FLORIDA - Hurricane Irma reached Category 3 strength late yesterday and continues to maintain maximum sustained winds near 110 miles per hour. And while disaster officials in the Leeward Islands say it’s still not posing a threat at this time, they’re keeping a close eye on it. At 5 a.m., Hurricane Irma, carrying maximum sustained winds near 115 miles per hour, was about 1,665 miles east of the Leeward Islands and moving towards the west northwest at 12 miles per hour. The National Hurricane Centre (NHC) in Miami said a turn toward the west is expected by tonight, followed by a turn toward the west-southwest tomorrow. By 11 a.m., Irma was about 1,580 miles east of the Leeward Islands after barely picking up speed, moving at 13 miles per hour. It was moving in the same direction and maximum sustained winds had reduced slightly to 110 miles per hour. “Fluctuations in strength, up or down, are possible during the next few days, but Irma is expected to remain a powerful hurricane throughout the weekend,” the NHC said in both advisories. Residents of the Caribbean, particularly the Leeward Islands, have been advised to keep a close eye on Irma although there are uncertainties about where it will head. 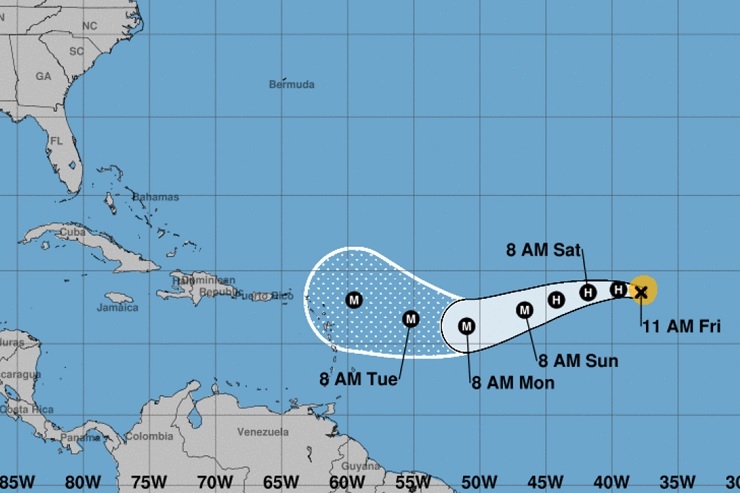 Acting director at the Barbados Meteorological Services Sonia Nurse told the Nation newspaper that the hurricane was still a long while away and although the models were diverging, they did not bring the center anywhere over the island. “It would still be to our north east so we will continue to monitor the system. By tomorrow we will have a better idea of where the system is likely to go, but even then it would still be a long way from us,” she said. Over in Antigua and Barbuda, director of the National Office of Disaster Services (NODS) Philmore Mullin said residents should take every precaution as though the island will be impacted. Irma will reach the area sometime early to mid-next week.